My previous ruminations on dividend paying companies can be found here, here and here. What do you think of the following "investing" strategy? Put money (not needed for the next five to ten years) away to invest as you would normally. Place it in the highest yielding, safest asset (e.g., a money market account, high yield savings account, a short term CD). Figure out how much of the original amount (leave any interest you earn alone) you're willing to lose per year for the chance to gain that amount, e.g., 5%, 10%, 15%, 20%. Once each year, take that portion out of your safe account, and go to a casino. Find a roulette table and bet the entire amount on black or red. You have a 47.37% chance of winning, and a 52.63% chance of losing. Say you take 10% of your investing money. If you win, you'll have a 10% gain for the year (not counting taxes), plus whatever you earned in interest as well as savings on broker costs you would have paid trading stocks, and minus the cost of going to the casino. If you lose, you'll have a 10% loss, minus whatever you earned in interest and would have paid in broker commissions plus the cost of going to the casino. The lucky practitioner of the above strategy will handily beat the market. Since the odds favor the house, however, the average person will lose money at the casino. Whether principal will be lost will depend on how much interest gains offset "investing" losses and expenses. For example, if your safe account earns 5% interest for the year (after taxes), and your gambling losses and expenses amount to 2%, you'll be up 3% for the year. If you earn 5% in interest, but your losses and expenses amount to 12%, as another example, you'll lose 7% for the year. You don't lose principal when your losses and expenses are lower than what you've gained in interest after taxes. As far as strategies go, I don't think the above is any worse, or much different from investing in individual non-dividend paying stocks. It might even be better, as far as your odds go. Picking a long term winning stock is in all cases a matter of luck, unless you can see the future. No one knows what will happen in five years, or ten, twenty, etc. A company that looks great today may not be around in ten years. A company that looks great today and still does so ten years from now may have a lower stock price then than it does today, even if its earnings grow. Examples are easy enough to find. As I mentioned in a comment here, take a look at Google (GOOG) and Apple (AAPL). Google traded over $300 a share when its earnings were around $5 a share; it traded over $400 a share when its earnings were around $9 a share; and it traded over $700 when earnings were $13 a share. Now that its earnings are around $15 a share, Google is trading around $310.17 (last close), at the same level as when earnings were three times lower. Apple was around $150 when earnings were $3.90. Now, when earnings are $5.36, the stock is at $90. Or take a look at Cisco Systems (CSCO). Below are charts of its earnings per share and price per share for the last ten years. The two bear little relationship. There are many other, similar examples. You have to know when to buy and when to sell. Research can certainly help. 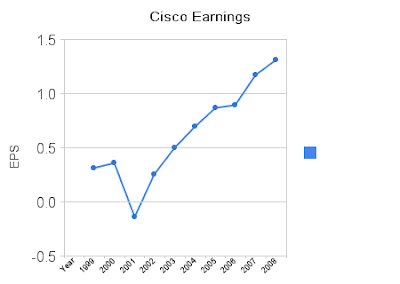 Perhaps you would have avoided Cisco in 1999 because its P/E was around 100, but you would have missed the big gains to come, as the stock tripled in price from January 1999 to March 2000. The point here is that how well you do in long (or short) term investing is a matter of luck. This is true of all stocks (and other asset classes). With dividend paying stocks, however, there is one big difference. You don't have to trade. While knowing when to buy is important (to lock in your yield), you don't have to sell to realize all your gains. Non-dividend paying stocks are useless unless you sell them (that's what infuriates me about share buybacks),* so you have to be lucky twice--when you buy and when you sell. Stock prices have little to do with earnings. They have all to do with expectations and optimism/pessimism. People usually buy when they're optimistic about a stock, and sell when they're pessimistic, which seems like a recipe for buying high and selling low. Many will say, OK, that's probably true, but you can get way bigger gains with non-dividend payers because they grow much faster. I agree 100%, but would still rather own a dividend payer, because with a non-dividend payer you have to know when to sell. Consider Cisco again. It grew its earnings 4.22 times from 1999 through 2008. Procter & Gamble, as a comparison, grew its earnings 2.8 times over the same period. Cisco's stock lost almost 50% during the ten years, while Procter & Gamble gained almost 50%. Procter, which traded around $45 a share (split adjusted) at the beginning of 1999 also paid $10.1925 per share in dividends during the period, that's a 22.65% gain without having to sell your stock (not very much, but you'd get nothing while holding a non-dividend payer). Stock price appreciation, along with dividends received amount to a 70% gain for Procter over the ten years, beating Cisco by around 120%, even though Cisco grew earnings faster. The time to sell Cisco was in 2000. Few people figured that out before they lost money on the stock. Note that Cisco kills Procter & Gamble over the longer term in share price performance. Buying the stock in 1990 and keeping it until now would have increased your investment around 200 times. Selling it in 2000 would have increased your investment 800 times. And that's the thing--when do you sell, and when do you buy? Earnings have continued to increase over the last ten years, but the share price plunged. Do you sell now or keep holding it? You get nothing as you wait, and what if the stock continues going lower? With a dividend payer you don't have to worry about that. As long as the company remains strong, either having stable or increasing earnings, you get paid to hold its stock. Procter & Gamble's 22.65% dividend return over the last ten years is on the lower end of those dividend paying stocks that have done well. Frontline (FRO), another stock in my dividend portfolio, for example, has returned over 600% in dividends over the same period (a little shorter, actually). Getting back to the above casino "investing" strategy, one complaint against it could be that it's not investing. As I noted previously, though, unless you buy stock directly from a company you're not really investing either--you're just buying a piece of paper from some other person; the company benefits indirectly, if at all. With a non-dividend payer, you're hoping the Ponzi scheme we call the stock market survives at least until you decide to sell your stock, and that people are willing to bid the stock's price up while you're holding it. On the other hand, the dividend payer gives you cash for owning it, no matter what is happening to its share price. With the best dividend payers, you never have to sell. Since you have to trade non-dividend payers to make money, and no one knows where a stock's price is going next, you're gambling. And what do you do with that money once you sell? If you invest it in another stock, you're gambling some more. As long as you're gambling, the casino strategy is not much different. One thing in its favor is that you can calculate its expectable outcome before proceeding, since all the probabilities are known. You also don't have to worry about doing research or watching the daily ticker. As the odds of losing are greater than those of winning in the casino strategy, it is a losing strategy over the long run. Nevertheless, as most investors, including professionals, tend to lose money on individual stocks or at least underperform the market, there's a good chance that the casino strategy may outperform most retail investors' portfolios composed of individual non-dividend paying stocks. If a losing strategy outperforms, maybe it's best to avoid picking individual non-dividend paying stocks. That's why I favor index investing over individual stocks, and dividend payers over non-dividend payers. * Some of Cisco's earnings per share growth has come from share buybacks. (Less shares = higher earnings per share even if actual earnings stay the same). Had the company used those billions of dollars to pay dividends instead of buying back shares, it would have been a better stock to own over the last ten years. Disclosure: At the time of writing, I owned PG and had an open order on FRO. Index Linked CDs, Are They Worth It?